I made Ginger Chutney for the first time at home. People of Andhra Pradesh make a special Ginger Chutney called Allam Pachadi which is similar to Kerala Puliyinji which we make for Onam. 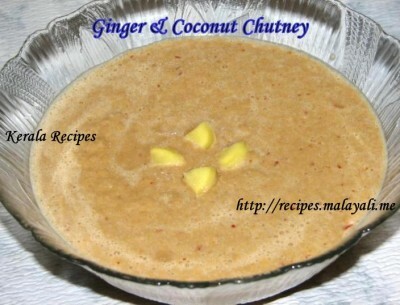 This recipe for Ginger Chutney is slightly different as coconut is used along with ginger. Ginger Chutney has a nice sweet and sour taste and goes well with Dosa. Limit the amount of ginger used to prevent the chutney from becoming too spicy. Soak tamarind in 1/2 cup of warm water for around 10 minutes and extract the juice. Keep aside. Heat oil in a pan and splutter bengal gram dal and urad dal. Add the ginger pieces and red chillies and saute for a few minutes and remove from stove top. Allow it to cool. Grind coconut, above roasted ingredients and tamarind pulp along with salt to form a smooth paste. If required, you can add little water while grinding. Serve this chutney along with Dosa. Ginger Coconut chutney is awesome with dosa.